i was given this card by my sister Ashley for some birth day in the 70s. 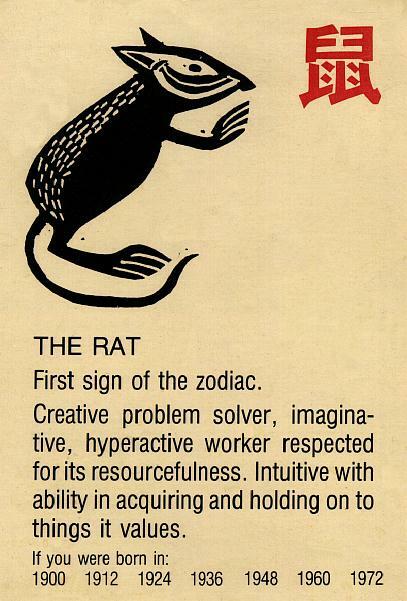 i always felt an easy kinship and identification with the attributes expressed here even though i was not born in the year of the rat. but, as stated in the origin of things rat-full, such trivialities as not being born in the "right" phase of such a cycle never got in the way of my delight in and curiosity about rats, their insatiable curiosity, soft furry cuddliness, extreme conditionability (i.e, "train-able"), good memory, and incessant habit to stop and clean themselves at all times of the day and night.